^ A Century of Service Cable and Wireless Ltd. 1868-1968, Bournehall Press, London, 1969, "The Eastern Associated Telegraph Companies Cable Routes 1898"
^ 中西輝政 1997, p. 154. ^ Brendon, Piers (2007). The Decline and Fall of the British Empire, 1781–1997. Random House. ISBN 978-0-224-06222-0. p. 660. ^ "Charles' diary lays thoughts bare". BBC News. 22 February 2006. ^ Brown, Judith (1998). 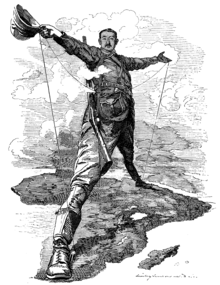 The Twentieth Century, The Oxford History of the British Empire Volume IV. Oxford University Press. ISBN 978-0-19-924679-3. Retrieved 22 July 2009. p. 594. 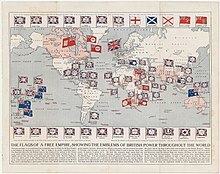 ^ "Britain, the Commonwealth and the End of Empire". BBC News. Retrieved 13 December 2008. Brown, Judith (1998). The Twentieth Century, The Oxford History of the British Empire Volume IV. Oxford University Press. ISBN 0-19-924679-3. http://books.google.com/?id=CpSvK3An3hwC 2009年7月22日閲覧。. James, Lawrence (2001). The Rise and Fall of the British Empire. Abacus. ISBN 978-0-312-16985-5. http://books.google.com/?id=4DMS3r_BxOYC 2009年7月22日閲覧。. Lloyd, Trevor Owen (1996). 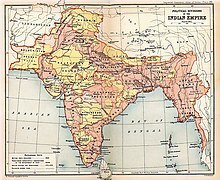 The British Empire 1558–1995. Oxford University Press. ISBN 0-19-873134-5. http://books.google.com/?id=gIBgQgAACAAJ 2009年7月22日閲覧。. Louis, Roger (1986). The British Empire in the Middle East, 1945-1951: Arab Nationalism, the United States, and Postwar Imperialism. Oxford University Press. pp. 820. ISBN 9780198229605. http://books.google.com/books?id=ATQQ0FMS1FQC&pg=PA718&lpg=PA718 2012年8月24日閲覧。.